Comilla University Evening MBA Admission Circular.Comilla University Evening MBA Admission Circular 2016 has been published in the national daily newspaper. The authority of Comilla University has been published an admission circular for the candidates of Evening MBA. The circular was published on their official website and daily newspaper in 14th February 2016. 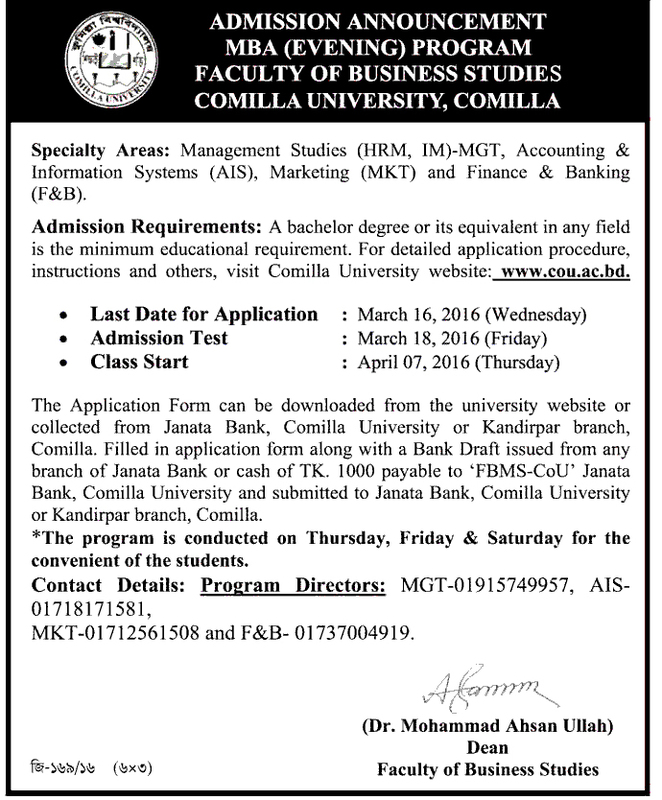 Comilla University Evening MBA Admission Circular 2016 has been published. They have announced an admission circular of Evening MBA program in Faculty of Business Studies. If you are interested and eligible for this then apply from Comilla university website or our site eduexamresult.com. Specialty Areas: Management Studies (HRM, IM)-MGT, Accounting and Information Systems (AIS), Marketing (MKT) and Finance & Banking (F&B). Admission Requirement: A bachelor degree or its equivalent in any field is the minimum educational requirement. For detailed application procedure, instructions and others, visit Comilla University website: www.cou.ac.bd. Admission Requirements & Application Procedures: A bachelor degree or its equivalent in any field including Engineering, Agriculture, Medicine, Social Science, Arts and Humanities, Business Studies etc is the minimum educational requirement. S.SC & H.SC: 1st Division= 3, 2nd Division= 2, 3rd Division= 1, GPA 4 & above = 3, GPA 3.00 – 3.99 = 2 and GPA Below 3.00= 1: Bachelor Degree (2 years): 1st Class/ CGPA 3.5 & above= 3, 2nd Class / 3.00 – 3.49=2 & 3rd Class / Below 3.00= 1; Bachelor Degree (3 years): 1st Class / CGPA 3.5 & above= 4, 2nd Class / 3.00 – 3.49=3 & 3rd Class / Below 3.00= 2; Bachelor Degree (4 years): 1st Class / CGPA 3.5 & above= 5, 2nd Class / 3.00 – 3.49=4 & 3rd Class / Below 3.00= 2, Masters Degree= 1. Filled an application form along with a Bank Draft issued from any branch of Janata Bank or cash of Tk. 1000 payable to ‘FBMS-COU’ Janata Bank, Comilla University and submitted to Janata Bank, Comilla University or Kandirpar branch, Comilla. The program is conducted of Thursday, Friday & Saturday for the convenient of the students. Contact Details: Program Directors, MGT-01915749957, AIS-01718171581, MKT-01712561508 and F&B-01737004919. Anyone can choose to finish the program within two to four years in a trimester system. The scholarship is available to meritorious students. Transport facility from Kandirpur, Comilla to Campus. Adobe Systems Contact Details: Program Directors: Department of Management Studies-01914172292, Department of Accounting & Information Systems-01716416603, Department of Marketing-01552428537 and Department of Finance & Banking- 01675108299. 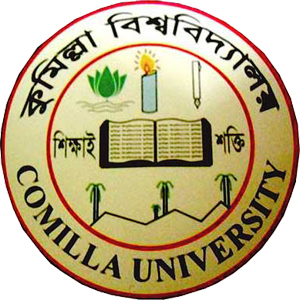 See Comilla University Evening MBA Admission Circular. We are also upload admission result on our site. This site also include admission related all the information. You can also know way the admission. Admission waiting list also available. As a result you are found all kinds of information here. You have to need only visit our site. We are provide all kinds of true information.